Kitchen! Kitchen! 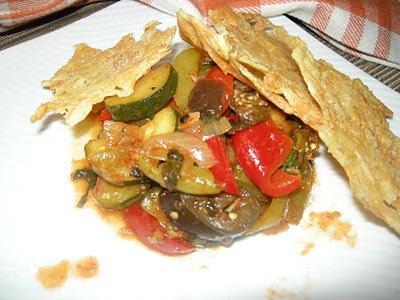 : ratatouille & cheese crisps.....at kitchen! kitchen! ratatouille & cheese crisps.....at kitchen! kitchen! cheese crisps - served as an appetizer. In a heated small non- stick pan - spread about a tablespoon of the shredded cheese on the heated pan and wait for the sides to color and slowly with a spatula flip on one side and wait for 1/2 a minute, slowly remove from the pan unto a waiting plate to cool. This whole thing only takes about 1/2 a minute on each side. Do one at a time (this is one of those that requires your full attention or you'll end up with a burned cheese crips). The cheese will be crispy once it has cooled. It is delicious!